It was fun to be on vacation but it feels so good to be back in my craft studio! I missed all my crafting friends, and I was anxious to try some of the new supplies that arrived while I was gone (I love online shopping!). For the background I sponged Distress Oxide ink in Fired Brick over Altenew's Layered Dahlia Stencil A. When that was dry, I placed the Layered Dahlia Stencil B over the top and sponged on Spiced Marmelade. Then I put the card through my Big Kick with Stencil A for embossing. The lily and sentiments are from Concord & 9th's Lily Set. 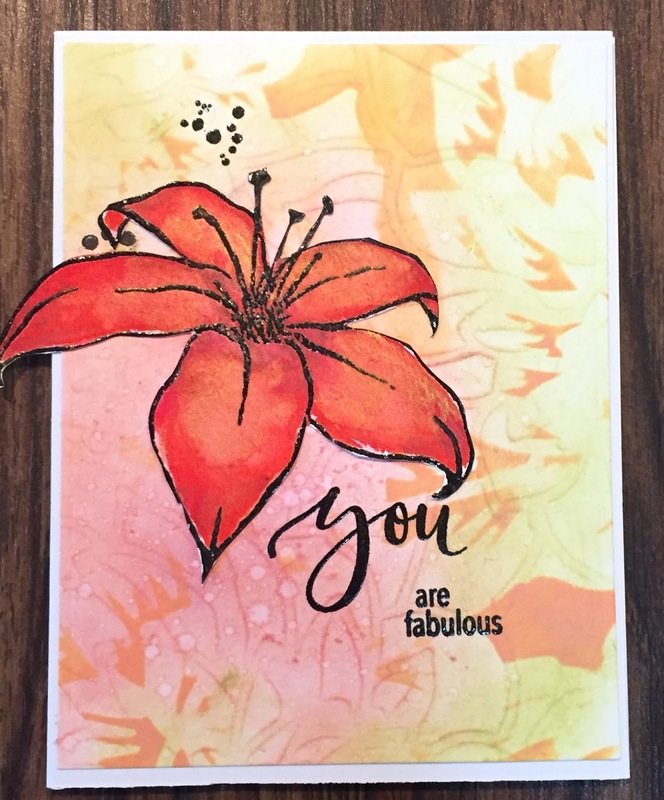 I embossed the lily onto watercolor paper using versafine onyx and clear EP. Next, I colored in with shimmering watercolors and fussy cut the entire flower. Beautiful card! Love that pretty flower!! Amazing background too!